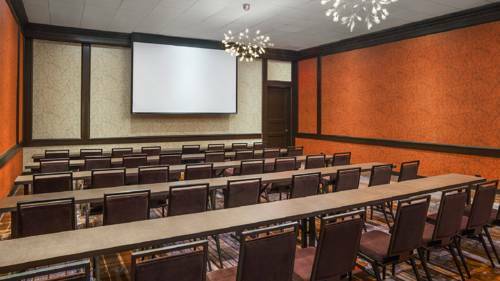 Sophisticated spaces await at The Westin Cleveland Downtown, just blocks from the Rock and Roll Hall of Fame, Great Lakes Science Center and Cleveland Convention Center. For sports lovers, the FirstEnergy Stadium and Quicken Loans Arena are less than a mile away. Dynamic works from local artists add a touch of class to our hotel lobby. Sample local ingredients and beers at Urban Farmer Steakhouse or grab coffee to go from our on-site Starbucks . Our 24-hour WestinWORKOUT Fitness Studio helps you stay fit in Cleveland. Host your downtown wedding in our 20,000 square feet of event space, which includes one of the largest ballrooms in the city. Elevate your event with A/V services from PSAV and kosher menu options from our catering team. Our downtown rooms offer stunning views of Lake Erie with floor-to-ceiling windows. Recharge in a Westin Heavenly Bed and enjoy complimentary cocktails in our Executive Club Lounge, accessible from Club Level rooms. Expect 4-star service at The Westin Cleveland Downtown. Urban Farmer: After a day in Cleveland, relax over steak and seafood at Urban Farmer. Our hotel restaurant combines Midwestern flavors with locally sourced ingredients. Sample regional wines and beers while you enjoy our casual, upscale atmosphere. Starbucks : Fuel your morning with a specialty coffee drink or breakfast pastry from our on-site Starbucks . After sightseeing or a business meeting in downtown, stop by for lunch or dinner and grab a quick sandwich or snack to go.